Do you love sports and enjoy the possibility of attending many of the different events that will take place over the next several months? If so, the right way for you to have a place to stay when you are following the teams you want to enjoy watching at a variety of locations is to purchase an Airstream Tommy Bahama model that can give you the comfort you’ve been searching for so that you can enjoy the ride on the road and the comforts of home. In order to see the different major sporting events that take place throughout the year, you need to take a look at the Airstream Tommy Bahama models that are sold at Ewald Airstream in Franklin, WI. Once you have the right travel trailer for you to have the experience you want to on the roads that you travel, it’s time for you to decide which sporting events you want to attend when you’re ready to get out and see the different sports and championships that take place throughout the year. Pick out the right travel trailer and start to have the ride you want. Which events are you going to attend over the next several months? During the Christmas holiday, there are always several basketball games that you can enjoy and this time of year falls squarely in the middle of the college football bowl series. When you have an Airstream Tommy Bahama trailer to spend your nights in you’ll be able to go back to the trailer and know you have the place to rest your head that’s all yours and not loud and crowded like the hotels will be around these events that take place in a variety of cities around the country. Once we get past the Christmas holiday, the College Football Championship will take place in January as will the playoffs for NFL Football as well. February brings us the Super Bowl, the Daytona 500, and the NBA All-Star Break, all of which can be a lot of fun for you. Once we reach March, the NCAA March Madness Basketball Tournament begins while April brings in the Opening Day of Baseball celebrations and the final championship weekends of the NCAA basketball tournament. You’ll love the Airstream Tommy Bahama and the comfort it provides if you choose to attend some or all of these events. If traveling to see the sporting events you want to experience and enjoy sounds like a lot of fun for you, the right place to find the travel trailer where you’ll rest your head is Ewald Airstream in Franklin, WI. 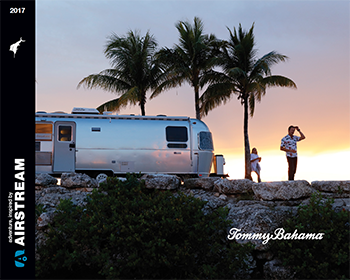 Come in and take a look at the Airstream Tommy Bahama model and see what this impressive travel trailer can be for you to enjoy the experience and the sporting events that take place throughout the year around the country. This will be the right place to lay your head after the fun you’ve witnessed.